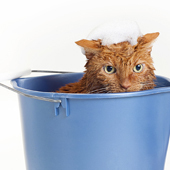 Discover the best ways to combat shedding, odors, and tracked-in dirt from pets in order to keep your home looking good and smelling clean. Spring arrives, and there’s something in the air. Is it the scent of flowers and freshly mown grass that has you sniffing — or is it pet hair and dander that has you sniffling? If it’s the latter, open the windows wide, let in the fresh air, and start spring cleaning.